World Series Primer & Predictions: If baseball is designed to break your heart, why does KC feel like THIS? Maybe I just run in baseball circles, but this city doesn’t seem concerned with any other sport right now. The Chiefs beat the Chargers on the road Sunday. Fun, but that’s not what’s most important. K-State won in Norman. Mizzou beat up on Florida. KU had their Late Night at the Phog at the same time as a Royals game and had one of the lowest turn outs in years. Defending MLS champions, Sporting KC, clinched another playoff spot the other night too. All of that is well and good, but it’s all back page news around here these days. It’s late October and the Royals have Kansas City’s full attention. Basically, Bart Giamatti was full of it. The World Series begins tomorrow night at Kauffman Stadium. It hardly feels real. Just typing that feels like I’ve made a mistake. I’m just certain I’ll wake up from this dream any second now. This isn’t real life. The Royals haven’t lost a game in the playoffs. They “swept” the Athletics in the Wild Card game, 1-0. They swept the Angels in the ALDS, 3-0. They swept the Orioles in the ALCS, 4-0. No team has ever gone 8-0 in the playoffs before. This team is already historically successful and have out-performed even the most hopeful fans’ expectations. 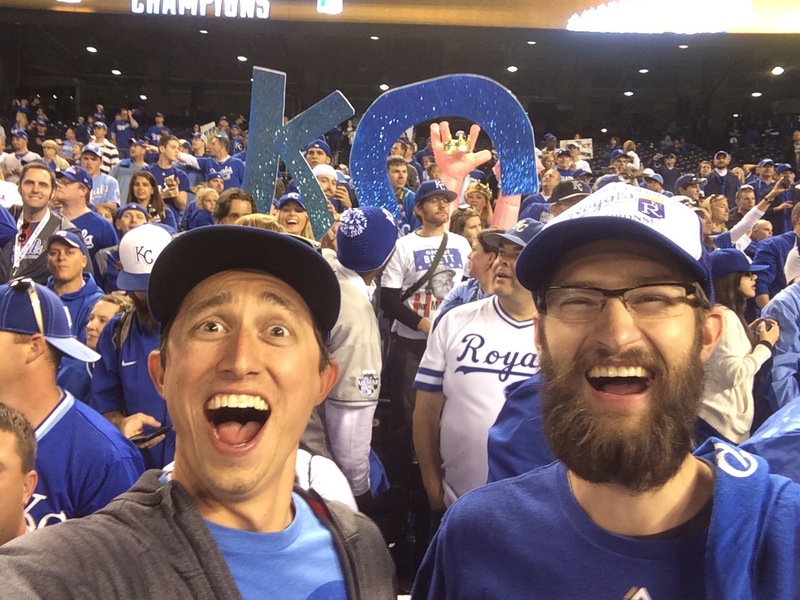 Royals fans everywhere would’ve taken the pennant, right? Why would we ever be greedy? Any success is better than our success in recent (and not so recent) years. The mere fact that the pennant was ours to have would’ve been enough. Except now it’s not hypothetical…and we’re all getting greeeeeeeedy. Which is exactly what we should be doing. We want more. Consolation prizes are for suckers. No one cares about the “also rans” or the “honorable mentions.” To quote the great poet Vanilla Ice, “Anything less than the best is a felony.” Kansas City deserves to be greedy – 29 years of futility has earned them that. This fan base has learned to be okay with coming up short. Moral victories are sort of this city’s thing. Not this time. We want 4 more wins. That’s all it takes. Four more. I can’t even imagine what this place will be like this time next week. I don’t even want to think about it. I just want to feel it when it gets here. There’s no such thing as heartbreak at this point. We’re past that. But we’ve also earned ourselves more than a moral victory, so let’s keep rolling, okay? Four more. Now it’s time for some Fall Classic predictions. Let’s get to it. Prediction 1: James Shields takes a no-hitter into the 4th inning. This goes for either Game 1 or Game 5. James Shields hasn’t looked sharp thus far in the post season. He’s been very beatable in his three starts so far. For some reason I think I’ll go against the grain this time around. With the strength of his cutter and change up, I think he’ll breeze through the Giants lineup early and avoid any hits until the second time through the order. He’ll need to be on point, because Madison Bumgarner has been the arguably the best pitcher in the postseason. Hopefully the offense can scratch across a few runs for Shields. Prediction 2: Jake Peavy and Tim Hudson get lit up for a combined 11 runs in their starts. Peavy is on for Game 2 in Kansas City and Hudson ought to get the nod for Game 3 in San Francisco. Whether the Royals win Game 1 or not behind James Shields, they ought to be up at least 2-1 after three games with the way they destroy these two guys. Billy Butler, Alcides Escobar and Alex Gordon all destroy Jake Peavy. The Royals numbers against Huson are slightly less impressive, but Raul Ibanez has SIXTY-SEVEN career at bats against him. Since Ibanez’s role on this team is borderline player-coach, he should be able to prep the rest of the lineup on Hudson. Interesting to note that Ibanez absolutely smokes both of these guys. Which brings me to prediction 3. Prediction 3: Raul Ibanez gets a hit in the World Series. UPDATE: Ibanez was left off the World Series 25-man roster, so this prediction is pointless. Thus far, Ibanez hasn’t even been on the Royals postseason roster. Josh Willingham has taken his potential spot mainly because Willingham doesn’t look straight out of a Just For Men ad. But Ibanez’s numbers against the Giants pitching is way too good to leave him off the roster. If they want to add him, they’ll have to drop Tim Collins off the 25 man roster, which is doable, but going up against an NL team, relief pitchers will probably be at a premium. Which brings me to my next prediction. Prediction 4: Danny Duffy logs multiple innings in this series. Maybe a starter gets knocked out early. Maybe another game goes 18 innings. Maybe Ned Yost mismanages the whole pitchers-batting thing and runs down our bullpen in SF. I don’t know. I just really want to see our statistically best pitcher get into a game somehow. Prediction 5: Eric Hosmer drops a homer into McCovey Cove. This is more hoping than predicting at this point. When I was in SF for my ballpark tour, we saw two HRs hit over our heads. I would love to see a #HOSBOMB land in the bay. Prediction 6: The Kansas City Royals win the World Series in 6 games. I’m confident in Shields in Game 1, but I don’t think he’ll be good enough to beat Madison Bumgarner. Bumgarner has been lights out this postseason. Ventura has been lights out. Vargas has only given up 4 hits in his 2 postseason starts (3 of them home runs), but I like his odds on the road. Guthrie has an ERA of 2.25 since the beginning of September and was awesome in Game 3 last week. It seems pretty likely that the Royals can come back home with a 3-2 series lead for Game 6 – Ventura vs Peavy, and Ventura takes us home with another gem. Which brings me to my final prediction. Prediction 7: Yordano Ventura is the World Series MVP. There it is. I have all the confidence in the world in Yordano. He has given the Royals a reason to celebrate since the beginning of the season. Every day he takes the mound, I feel like something magical is going to happen. It would surprise me if Yost allowed him to throw beyond the 6th inning with the strength of our bullpen, but it won’t matter. He’ll go 2-0 and won’t allow a run. And once again, the Royals are poppin’ corks in front of their home crowd. Four more. See you at The K.